A herniated disc occurs when a portion of the vertebral disc ruptures. 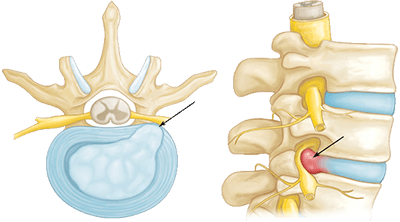 Through the ruptured portion, the inner central portion of the disc (nucleus pulposus) is pushed out into the spinal canal on nerves in the cervical, thoracic or lumbar areas. Because the spinal canal has limited space, the displaced disc presses on the nerves which can often lead to numbness and pain. Smaller herniations are sometimes called protrusions. Continue reading about the causes and symptoms of a herniated disc, or use the following link to learn about the possible treatment options for herniated discs. Call us at anytime at 1-888-409-8006 and ask us about the Possible Treatments & Procedures for Disc Herniation. To proper diagnose a herniated disc, your orthopedic doctor may order imaging tests such as X-Rays, MRI or CT Scan. A CT Scan and/or MRI can show soft tissue of a herniated discs. Furthermore it can also show the actual stage and location of the herniation. 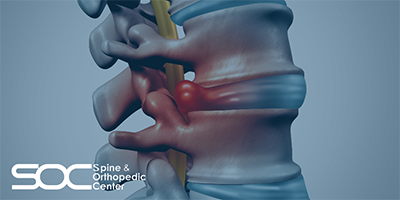 At Spine & Orthopedic Center, our orthopedic doctors and surgeons specialize in treating herniated discs. Our facilities are also equipped for proper and efficient diagnosis of herniated disc such as digital X-Rays, MRI equipment, Laboratory and Procedure Suite.